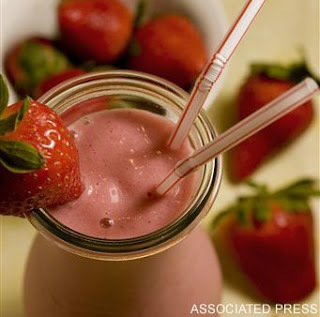 Make a strawberry raspberry tofu smoothie. All these ingredients are good sources of omega-3 fatty acids, which researchers say make people less prone to depression. 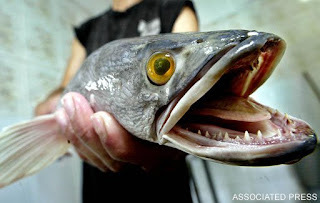 Salmon, cod and walnuts are also high in omega-3s, but I figured you wouldn’t be keen on a cod smoothie. But that’s just me. Chances are you don’t get enough omega-3s anyway. And symptoms of a deficiency are tricky. You might experience fatigue, dry skin, brittle hair, constipation, frequent colds, depression, poor concentration, lack of physical endurance and/or joint pain. Sounds like me on a Monday. Besides improving your mood, omega-3s have a bunch of other health perks. They may help prevent or treat Alzheimer's disease, asthma, ADHD, cancer, diabetes, high blood pressure, migraines, multiple sclerosis and obesity. So feel free to sneak some strawberries (or salmon!) into your diet. You'll feel better and have stronger hair – like on those Garnier Fructis commercials. This entry was posted by kate, on Tuesday, July 14, 2009. You can leave your response .